Make them THINK TWICE before trying to STEAL what's yours!!! What can I do? 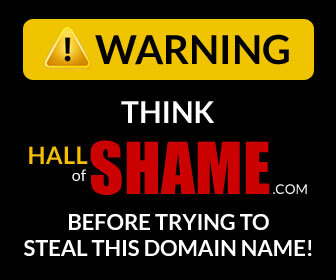 Add HallofShame.com banners on your domains. As well as, circulate this site, tweet it, like it, comment on Linkedin... THAT is a very small effort to help protect your livelihood and your assets that costs nothing and helps put these folks on notice. THAT is how to help STOP Reverse Domain Name Hijacking, protect your domains and expose scum on the Internet.